Tonlgen is a form of Buddhist meditation which aims to foster effectively the principles of compassion for others and acceptance of the inevitability of suffering. In employing these dual roles the individual is taught to be humble in trying to empathise with and reduce the suffering of others whilst simultaneously accepting their own suffering. Tonglen has been practiced since the 10th century by Tibetan Buddhists and is still practiced daily by The Dalai Lama, who claims that it makes him feel more adept at coping with the suffering of others in the world, and with helping those who are suffering. Tonglen meditation proceeds through a process of sending and receiving. 'Tong' means to send out, whilst 'Len' means to receive. In the process of this meditation the individual sends out good feeling as they breathe out, and takes in the suffering and bad feeling of others as they breathe in. The idea is to accept those bad feelings on behalf of others, and thus to neutralise them and to send out more good feeling. In the process the ego of the meditating individual is addressed as they accept bad feeling and suffering, realising that it is both intrinsic to life and also transitory. Suffering always exists somewhere, and it is not 'my' suffering' or 'their' suffering, but simply 'suffering', which can only be neutralised by engaging with it. Once this is done, the message learnt about suffering can be taught to others more effectively - in this sense the taking on, or taking away of their suffering is realised practically. Clearly, practicing Tonglen runs completely to our normal system of thinking and being. Usually we wish to avoid suffering, even displacing on to others rather than taking it upon ourselves. The only problem with this is that as suffering is intrinsic to life, that suffering will always bounce back at us, and we will often be totally unprepared for it, making the impact worse. Tonglen aims us to be more realistic and more prepared for suffering. Tonglen meditation involves clearing the mind and focusing on someone you know to be suffering. This can be a friend, a stranger, or even an enemy. Imagine a connection between yourself and that person, and then imagine all of their suffering emerging from them as black smoke. Then imagine yourself breathing in this smoke, and it descending to a point around your heart where it smothers and diminishes your ego, thus diminishing your fear as the suffering of your imagined other person has been taken on. Now that this is achieved, imagine your self purified and sending out love in the form of pure white light as you breathe out. 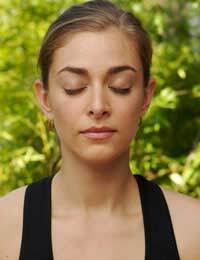 Continue this process of breathing in and breathing out for anything between 5 and 30 minutes, or longer if you have longstanding previous experience of meditation. The practice of Tonglen can be taken out into your everyday life as you make efforts to understand the suffering of others, take it upon your self as your own suffering (thus diminishing your individual selfish desire to avoid suffering) and then project good feeling back on to the sufferer. This will be easier as part of a wider programme of relaxation and meditation. Tonlgen meditation can be practiced several times weekly, but is not practiced as a sole form of meditation.